Today I had a client who claimed she’s only ever had her nails done once before! She said the last set of acrylic nails she had were shockingly bad and has never had them done since. So off I went starting her acrylic nails ready for her holidays. I always ask all my clients what they are wanting on there nails. This lady didn’t have a clue but she explained she wanted a pointed (almond) shape that she’d seen on my Facebook page. http://www.facebook.com/pages/The-Apprentice-Beauty-Blogger . I explained they were done with acrylic natural tips but before beginning I also asked if she wanted a colour. She replied saying she did yes, therefore I began explaining I could use either VINYLUX (A week long lasting ordinary nail polish) or Shellac (A 2 week long lasting permanent nail polish, ideal for holidays) The lady chose Shellac as she was going to a wedding and also on her holiday to Egypt. After retrieving this information from her I explained what I was going to do to achieve the nails she wanted to stop her from worrying and then began the work. Her acrylic nails were completed and next to tackle was the Shellac. My lady seemed very confused on what Shellac was and how it works, she asked a lot of questions like ‘What does the lamp do?’ ‘Will the UV give me a tan like a sunbed’, ‘Do I need to do anything to look after the nails’ etc. When clients ask me questions not only does it show me they care about their nails but it also tests my knowledge which I love. 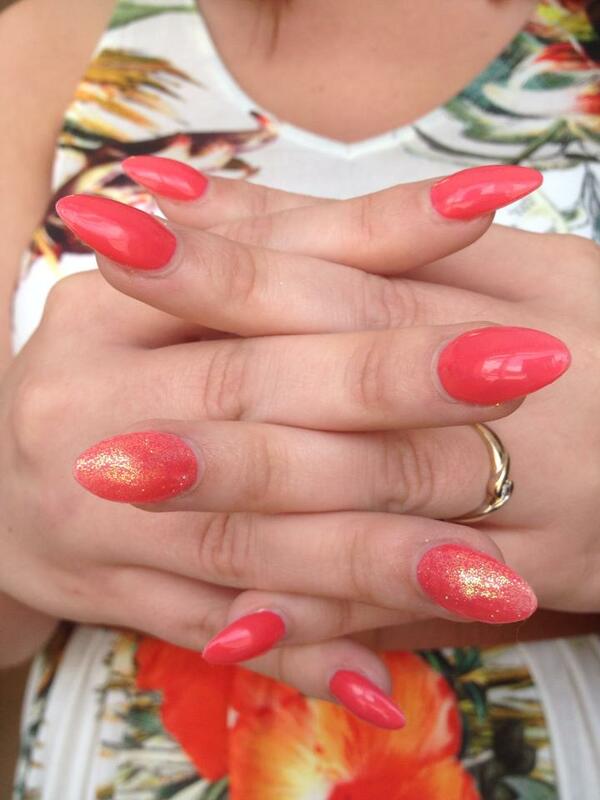 We finally came to an agreement on a coral colour – Tropix with Rockstar ring fingers. My client was very very impressed with her nails in the end. I gave her the correct aftercare such as using Nail Oil and she couldn’t stop smiling about her nails. Client’s like these are my favorite ‘Nail Newbies’ always seem to be interested in what I’m doing and always test my skills. They definitely appreciate your work and it makes it worth my time and effort to see their faces afterwards. She left with the perfect nails for her holiday and I’m sure she’ll be returning soon!